Loading Dock Seals & Dock Shelters - Otco, Inc. Loading Dock Seals & Dock Shelters - Otco, Inc.
A lot of your business’ activity happens on your loading dock: order arrival, out going shipments, the loading bay door going up and down, and more. And no matter how smooth your operation, or how well constructed your loading dock is, with a door that large, there is always the opportunity that dust, pests, and insects can enter your facility. That’s where Loading Dock Seals & Dock Shelters come in! What is a Loading Dock Seal? 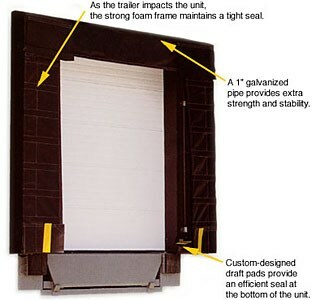 A loading dock seal creates a weather-tight seal between the loading dock and truck. This seals out weather and external temperatures and helps maintain the internal temperature of your facility. A loading dock seal also prevents fumes, pests, insects, and dirt from entering. And that can save you time, money, and hassle! As the truck compresses the seal, specially formulated foam envelopes its sides and head to attain an extra tight closure. As the truck pulls away, the foam immediately regains its original shape. The Foam Dock Seals are specifically designed to provide a weather-tight closure for oversized dock doors where a header pad is not practical. Unfortunately not all loading docks are built the same, which means that an off-the-shelf loading dock seal may or may not work for your needs. This is where OTCO, Inc. can help! 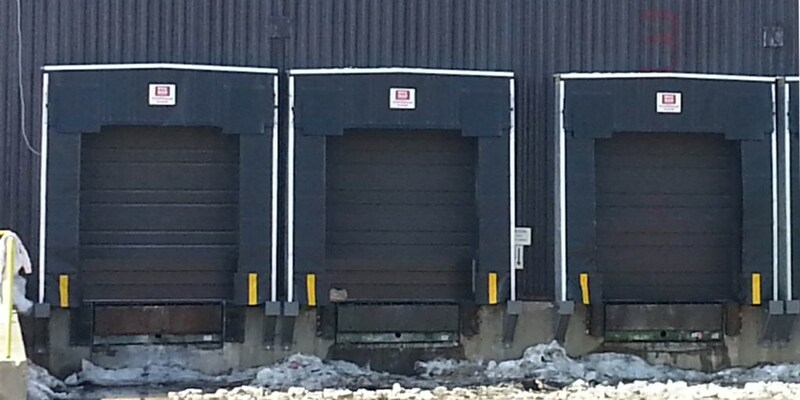 Our loading dock seals are custom built to suit your facility. Our distinct craftsmanship, along with quality materials, creates a weather-tight seal, guarding you from the elements. What is a Loading Dock Shelter? Unlike the air-tight seal provided by a loading dock seal, a loading dock shelter gives you more flexibility for dimensions while still offering a seal to protect your goods and block out pests. As the truck backs through, the shelter top and side flaps, fortified with built-in fiberglass stays, press firmly against the truck sides to form a snug seal. OTCO’s premium retaining flap that joins the top and side flaps enhances this seal and eliminates air gaps. Foam filled bottom pads inhibit air infiltration from the bottom. OTCO, Inc. offers loading dock shelters with both translucent side and top panels to let in light or with removable curtains when you need complete access to the trailer opening. LS-75 Dock Seal is ideal for door openings of 7’ to 9’6” wide and 7’ to 9’ high. LS-95 Dock Seal is ideal for door openings of 7’ to 10’ and 9’6” to 12’ high. The RD-70 Rigid dock shelter give you full access for loading and unloading trucks. This unit has translucent sides and top to keep the areas bright. Sentry 21 shelters are high quality, rugged construction weather tight seals that allow complete trailer access. This unit allows full access for loading and unloading truck and NO STEEL SUPPORTS NEEDED.